The game of Skyrim isn't just what's on the disc. It's not just questing through the woods, killing dragons and saving villagers. 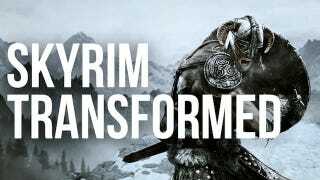 The game of Skyrim is also the game of changing Skyrim, of transforming its graphics, adding more dragons or playing as a midget. The game of Skyrim is figuring out how to make the best map of the land, how to cheat the leveling system and how to export the game's books to your iPad. You don't just play Skyrim. You play with it.